Friends! How is Easter THIS Sunday?! Time is flying, but I also feel like it is a bit early this year. To me, Easter always means a cute dress and allll the Reese’s peanut butter eggs (my FAVORITE). I had so much fun shopping around for other fun Eastery finds for you guys- I feel like all of these would be great for Sunday, but also so great in general for the season! Hi guys! Today’s post might completely surprise you, but I am excited to share it with you. I am always on the hunt for well priced options for you guys, so I was super intrigued to find out that Walmart (yep you read that right!) carries SO many brands that I love. Did you guys know that they carry BCBG, Levis and Sam Edelman?! I know you just answered no and I was definitely surprised (and excited!) to find out they do too. I adore these two finds and saw all of these other cute options too while shopping around. The best part about it all? You can grab your shampoo, your face wash and some groceries alllllll while also adding these fun fashion finds to cart! If you have been following me for awhile, you know I swear by L’Oreal Sublime self tanner and Walmart is one of the only places I can find it in the “deep” shade. SO now I can grab that and some cute clothes too. So convenient! 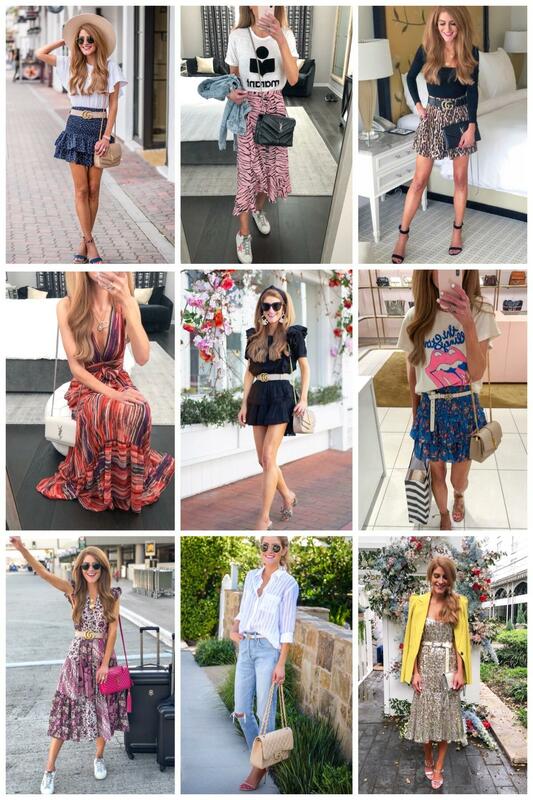 I included the pieces I am wearing in that grid, so happy shopping! Hi friends! Happy Wednesday! 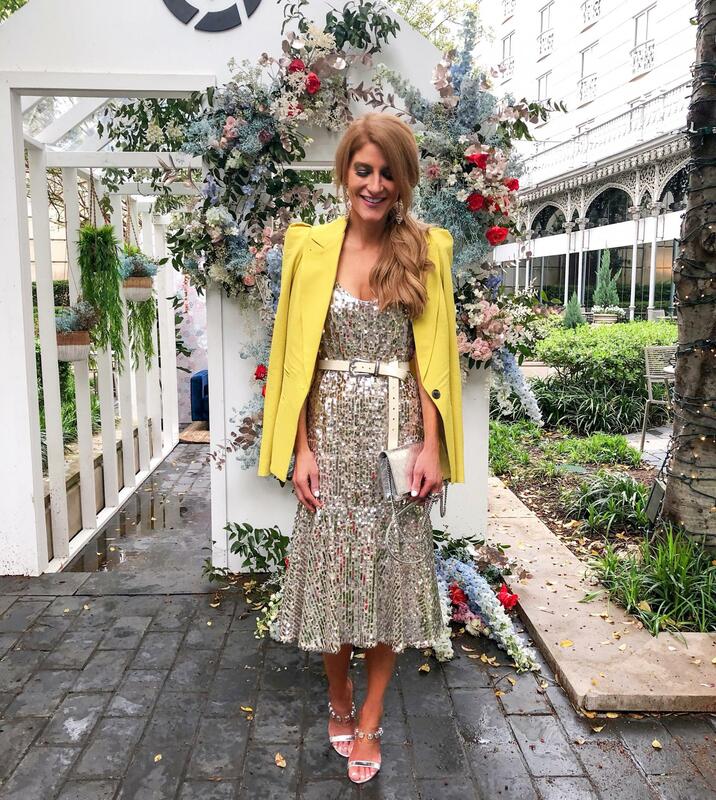 Shopbop is running their “spend more, save more” event again, so I wanted to share some of things I have recently posted on Instagram that are part as well as the pieces I am adding to my cart! Definitely an add to cart kind of day! Hii guys! I got home from the Rewardstyle Conference on Sunday and have been on such a positive, motivated high since. That being said, the weeks leading up to it, I was having all the feels! I wanted to open up a little bit to you guys and share those feeling, my thoughts on the conference and just some overall realness with you guys. To start, if you are not familiar with the Rewardstyle Conference it is an annual weekend held in Dallas where RS is headquartered. 200 influencers are invited and the invites are based off of yearly performance. The weekend consists of classroom sessions, brand meetings and nightly cocktail parties where you get to mix + mingle with other bloggers, brand reps and the RS team. So obviously its a HUGE honor to be invited and every year I get nervous I might not make the cut as there are so many influencers who use RS and every year that number grows. This was my third year being invited and attending and every year the same thing happens. At first, I am just SO excited to be invited, but then as the conference gets closer, I start FREAKING. I am like, what if these other girls don’t like me this year, what if my outfits are not cute enough, what if brand meetings dont go well…basically thinking all the bad thoughts and setting myself up for failure (for NO REASON!). Here’s the thing, I am normally a fairly confident person. Especially when it comes to fashion! But, in this situation it’s so different. You are surrounded by the best of the best and each year they get younger and cuter. Haha, but also, for real! SO like any girl (or human for that matter), I lose all my self confidence and become this awful mess of self doubt. Luckily, I have Colby (my husband), my mom and my sister who are all super supportive. And they each constantly remind me that I am me and that I was invited for a reason and that I should embrace who I am not and not question that. I am so grateful for them, but in reality, no ones words can supress your crazy mind when you are a total stress case, right?! I always start working on outfits about 3 weeks out and normally when I create looks I take a few hours playing with accessories, but with this I always get hypercritical and crazy! Its so funny because none of the looks every seem good enough, but when I look back at pictures afterwards, I am always like, “omg that is so cute!” Haha, why do we do these things to oursleves? Ok, back to the conference. The reason I go every year (even though I know it will cause me that same crazy social anxiety and self doubt) is because I know it is amazing and so so so worth it! Every year I learn so much. From the classroom sessions to even just socializing with other bloggers. You learn tricks they use or hear what works for them, which is so helpful. In the classroom sessions you see statistics of what works for the best RS bloggers, learn tools to better your blog/Instagram reach, hear about new and upcoming changes to the LTK app etc. And its just always so fun to meet other bloggers you follow and interact with on a daily basis. This year I did something different that I had not in previous years. I had spent so many days worrying over it all, to the point that I told Colby maybe I shouldn’t go this year. He told me to get over myself and it all and that I had to go (thank goodness for him, because I knew deep down I wanted to and that it would be so fun). When I got on the plane to head to Dallas, I had this weird epiphany or something as I just felt super calm and ok with it all. I told myself that A) I was invited for a reason and that in it self is an accomplishment I should be proud of and B) instead of assuming people might not like you or want to hang out with you, assume the opposite! I decided I was going to just be myself and hope for the best with everyone I met. If someone wasnt nice back, it was going to be what it was and who cares?! I can only control myself and I know I am a loving, kind, fun and fab person. The real tidbit I will include is that obviously not everyone you meet on Instagram is going to be who they are in real life. That’s just reality and probably doesnt surprise any of you. I am 100% who I am on Instagram that I am real life. If I like and comment on your pictures or follow you, its because I genuinely like your style and support what you are doing. To me, we are all just girls who love fashion and are trying to help other women find clothes that will make them feel good about themselves! So what about that makes it ok for some of these bloggers to think they are better than another? I have NO idea, but I don’t support it and never will be that person. I do not care how many followers you have, I just care that you are kind human. Kindness is all that matters! Plus, there is room for all of us, so enough with the cattiness. That being said, most the girls are who they show themselves to be and I just LOVED getting to hang with them. Here are some of the girls I was lucky to get to know better and hang with. All gorg inside and out! I think in life it’s so so important to push yourself outside your comfort zone. I am the worst at getting in a routine and not branching out enough, but when I do, I always feel good about myself and I always grow from those experiences. I am SO thankful to have attended another Rewardstyle Conference and I am always just blown away at the whole weekend. Their events team is amazing and plan the coolest things for everyone. The attention to detail is over the top and just so fun to get to be a part of. I truly feel so personally motivated to keep up my game and really challenge myself to do as much as I can to help you guys (aka the reason why I am here). I am going to try to share more real life, more of myself and more of fashion of course too! One big takeaway: BE YOURSELF. We are each our own amazing, unique person and that is what makes us special. Embrace that, do YOU, share YOU and dont try to be anyone you are not (its kinda cheesy, kinda a no brainer, but always a needed reminder). Quick recap of my outfits! 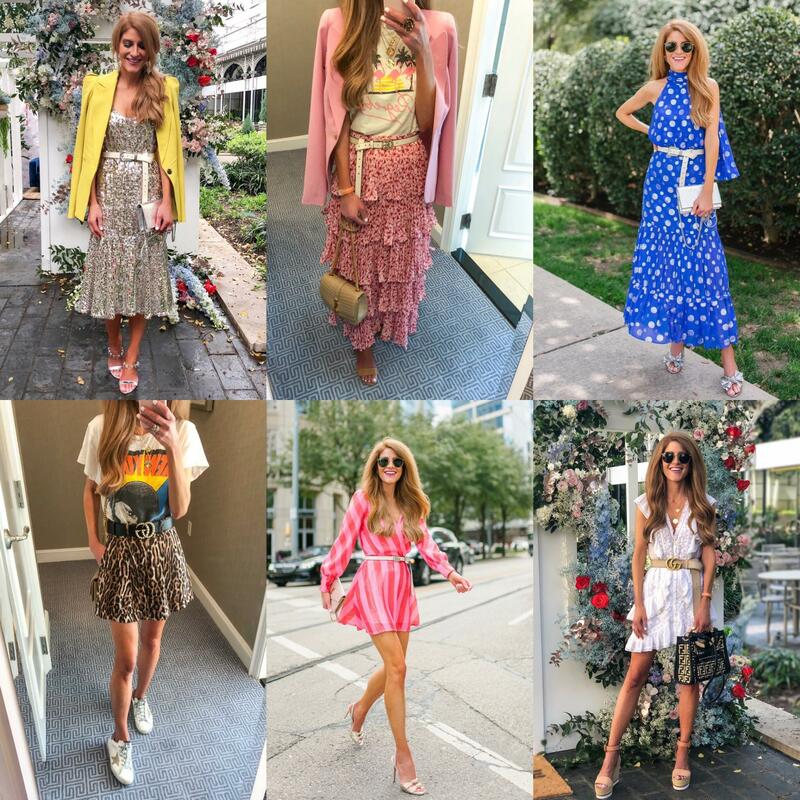 Here are all the looks I wore- my sequin dress and citrine color blazer was probably my favorite followed closely by the long tiered floral skirt + graphic tee combo…eek I want to wear all these again! If you have any questions or anything, please email me or DM me on Insta! I love chatting with you guys, always! Thanks so so much for reading! Heart you all and feel so lucky to be able to do this as my job….its a dream!